The current construction at the Rothrock building runs through the building with celerity. Fifteen years ago, Joel Deuterman, the President and CEO of Velocity Network, was standing in the main atrium of Alcoa's Global Headquarters in Pittsburgh. For the first time, he was contemplating the relocation of his multi-service technology company in Erie, going to the Steel City to tour facilities for inspiration. "Before people started talking about 'crashing' into each other in innovation district areas and spaces designed intentionally to create collaboration and mindshare, Alcoa was cognizant of the fact that when you jump into an elevator, you're by yourself or merely with whoever else is on the elevator, and you miss the opportunity to crash into other peers and other people in your organization," recalls Deuterman. "When I see someone in passing, I'm reminded of an idea or previous conversation and then the mindshare begins all over again," he adds. "It's just a hyper-cool and efficient method of communication." The desire to facilitate a more free-flowing exchange of ideas between employees guides the open-air concept Kidder Wachter Architecture & Design drafted. A stairwell springing from the center on the first floor of the under-intense-renovation Rothrock building at 121 W. 10th St. snakes upwards to the fourth, not encased in a silo, but open to the entire building. "It will just really empower every person that works for Velocity to have maximum communication amongst every other person," says Deuterman. 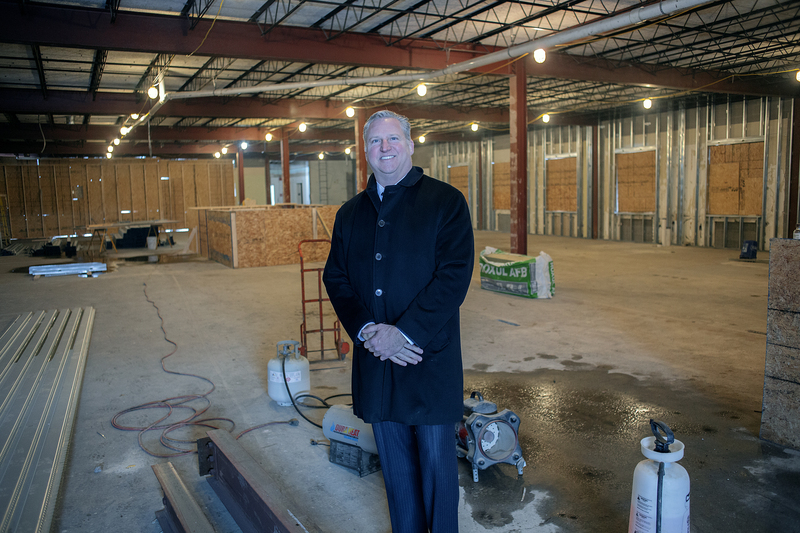 Joel Deuterman stands at the construction site of the new Velocity Network headquarters in the Rothrock Building at 121 W. 10th St. The building will be replete with many modern amenities and feature an open-air design. Rothrock now reverberates with the buzzing pulse of construction. Originally constructed by Baldwin Brothers Real Estate in 1960, yet most recently sitting vacant for years, the new Velocity HQ will be a 38,590 square-foot renovation yielding a bustling intersection of smart ideas in a smart building. After some delays in development due to some budget complications that have since been ironed out without significantly increasing the bottom line, it is anticipated to be open November 2018. Velocity construction isn't limited to the Rothrock building; Deuterman recently acquired the former Credit Bureau of Erie at 115 W. 11th St. at a sheriff's sale for $72,000. A block south, it extended the Velocity Campus footprint in February 2018. Velocity powers more than 600 buildings within the city and has nearly 500 miles worth of fiber crisscrossing Erie. And for those continually inquiring: When can I get fiber in my home?, fiber-to-the-home deployment has increased tenfold over the course of the past year. At the end of 2017, Velocity provided fiber to 10 residential units. That's now approaching 150 with another 150 slated for construction in the immediate future. The goal is to power 1,000 residential units by the end of 2018 and add another 1,500 to 2,000 each year after that, a now-faster pace of deployment thanks to a new technology that allows Velocity to plug a line in at a pole rather than splice each location individually. Since the announcement of the plan to move and expand back in July 2016, Velocity's added 20 employees to its workforce, for a current staff of 71 total employees. That, in addition to more crashing, is a quick and impactful win for a city Charles Buki encouraged to eschew "half measures." Dropping in 70-plus employees making family-sustaining wages into the core of the city is both a feel-good (Look, more people! Working in downtown! Where people have been leaving!) and economic development (Business! Downtown!) injection. "If you were talking five years ago, everyone would've said you're nuts," half-jokes Brad Wiertel, Velocity's Chief Operating Officer. "Even when we were looking at Ridgefield, people told us not to look downtown, not to waste our money down there." "We beg of you to be fearless in the face of resistance," wrote Buki, the principal planner for czb, LLC., the urban planning firm that completed Erie Refocused, the city's recently adopted city plan, in the "Letter of Transmittal: Comprehensive Plan City of Erie." "Your city is at a turning point," he also wrote. "In point of fact, Erie is at a crossroads, and, make no mistake, the clock is ticking." In addition to making moves to impact the city's bottom-line and downtown culture, Deuterman's also attuned to constructing a forward-thinking building for his employees and clientele. Rothrock will be smart, equipped with lighting that adjusts to the amount of natural light (which will be penetrating through the sky lights and the signature glass bump-outs on the building's front), smart temperature controls, reverse osmosis water fountains, and more. "What I'm most excited about is the momentum that our relocation downtown has [brought to] the city," Deuterman says. "The speculative buying of real estate — that hasn't happened in 30 years! And now it is. My dipping the first toe in the water has helped launch a revitalization of the city." Interconnectivity continues to thrive southwest of Erie's downtown, too. "Innovation occurs at the places where people and ideas intersect," Penn State Behrend Chancellor Ralph Ford said during the opening of the Advanced Manufacturing and Innovation Center in July 2016. "This center will provide the ideal environment for interconnectivity." Headway at the $16.5 million facility isn't hard to see — a maxed capacity academic-side of the building, and an industry side continuing to attract new business to the region (read: space is currently under construction for the announcement of a new partner in May). The former boasts, among many things, an environmental scanning electron microscope open to regional researchers (and not just those housed at Behrend), which, as one example, SKF Aerospace North America utilized to analyze irregularities in ceramic bearings in Apache helicopters, bringing in materials experts from Florida and North Carolina to look at samples. Additionally, Behrend has introduced the Innovation Commons, an ideation and product-design space. The space serves another key purpose for the advancement of innovation in Erie, proving to be a successful prototype site for the Innovation Beehive in Erie County. "Our open lab approach is a commitment to leveraging our resources for the benefit of our students and our community partners," explains Ford, who adds that the intersection of ideas goes beyond the AMIC, extending onwards to the Innovation Commons housed in the campus's Burke Center, a location that more than 10 years prior served as the nation's first academic co-habitation of business and engineering schools in an effort to encourage cross-disciplinary learning. 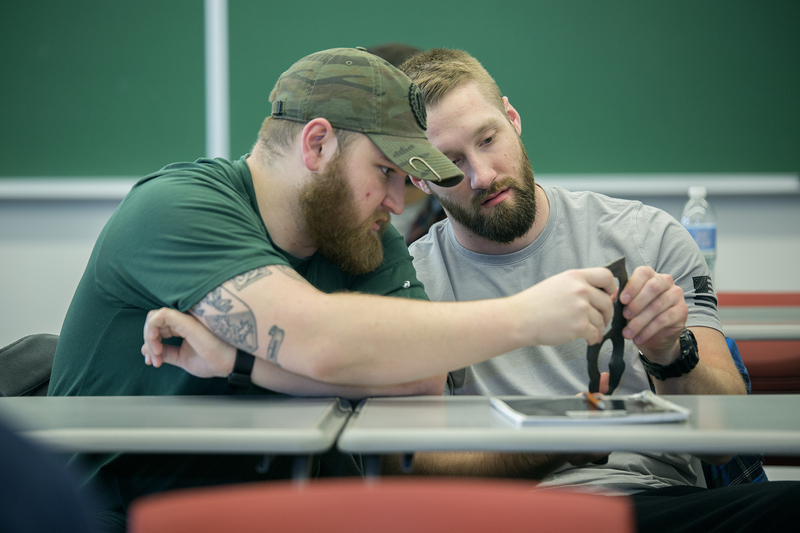 Penn State Behrend seniors Nick Spanglen (left) and Eric Orton (right) examine a scrap from a forging process for manufacturing defects. "The students who work there have collaborated on more than 80 projects for entrepreneurs and start-up companies," Ford says. "Those projects have led to three patent applications and two new start-up companies." Those collaborations include: Lace-N-Lock (a device developed by a team of students that helps people with disabilities or those recovering from surgery to tighten their shoes without having to bend down); a wall-framing tool envisioned by local house-flipper Jason Wokutch, who often works alone and often frames walls (read: really hard to do alone); and a fold-out emergency barricade (a portable, lighter barricade that could conveniently fit in the trunk of a police cruiser), an idea that came out of startup Grizzly Innovations. "Innovation Commons is an important component in a growing network of resources for entrepreneurs and startups," Ford says of the first site in the Northwest Pennsylvania Innovation Beehive Network. In October 2017, the Beehive received a $200,000 Appalachian Regional Commission grant along with a $200,000 match by the Ignite Erie Industry+University Business Acceleration Collaborative. That funding has created a unique business support network between Erie County's four universities. A three-year, $1.5 million partnership, Penn State Behrend spearheads the Ignite Erie Industry+University collaborative with funding support coming the Erie County Gaming Revenue Authority. The framework drives collaboration with the caveat that funded projects must involve partners at more than one member institution. Linked sites include Edinboro University of Pennsylvania's Baron-Forness Library (a lab focusing on advertising, marketing, and public relations for business startups); Gannon University's Small Business Development Center and the Erie Technology Incubator (focused on business development, including business analysis); and Mercyhurst University's Ridge College of Intelligence Studies (concentrated on business intelligence services and solutions to help developers commercialize their ideas). "As additional beehive sites open — each focusing on a different aspect of business development — local entrepreneurs will have access to a host of complementary support services," says Ford. Those support systems include the Blasco Library's Idea Lab, which launched in late October, helping to create a feeder system for business projects in the region. "We're helping them make their ideas a reality, which is good not only for the entrepreneurs, but also for the larger community." Ideas have space to become a reality, too, back in Erie's downtown with the launch of the Erie Innovation District. But Innovation and District often get bandied about casually. On a block brimming with millennials and Gen Zs toting the latest gadgets and gizmos, flippantly, one might say look, an innovation district! Simply proclaiming physical space an innovation district does not an actual innovation district make. As Brookings Institution Centennial Scholar Bruce Katz notes in "The Rise of Innovation Districts: A New Geography of Innovation in America:" "Innovation districts are the manifestation of mega-trends altering the location preferences of people and firms and, in the process, re-conceiving the very link between economy shaping, placemaking, and social networking." To best understand the recent evolution of the Erie Innovation District — not as a broad-brushed label but as an actual coalition of business and academia developing security, intelligence, and safety-based businesses housed at 717 State St. shared with the Erie Insurance Innovation Center — it's best to review the timeline, and to keep Katz in mind. Katz first visited Erie in 2014, presenting on his seminal 2013 work The Metropolitan Revolution at the Jefferson Educational Society's Global Summit and returned the following year, this time to espouse the importance of Advanced Industries. Consistent in Katz's message: Cities are on the vanguard of problem-solving and policy innovation — including innovation districts. Those in Erie were taking notes and making plans. October 2016: the Erie Community Foundation, Erie County Gaming Revenue Authority, and the Susan Hirt Hagen Fund for Transformational Therapy announced a $4 million grant to the Erie Innovation District. September 2017: founding partners (Mercyhurst University, Erie Insurance, McManis and Monsalve Associates, and Velocity Network) introduced Karl Sanchack, managing director of AB Innovations LLC, a Virginia-based consulting firm, as the Erie Innovation District's first CEO. Karl Sanchak (center), managing director of Virginia-based consulting firm AB Innovations, LLC, was named the Erie Innovation District's first CEO in September of last year. 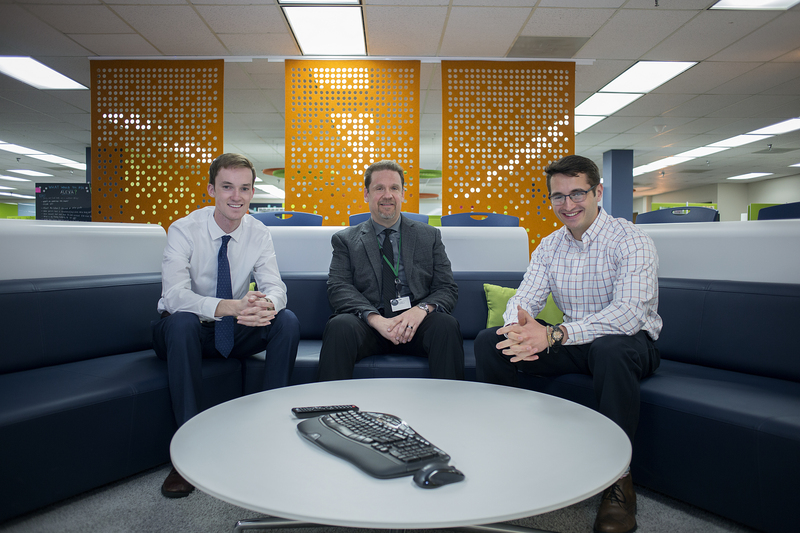 He sits with interns Nick Samsel (left) and Jordan Fuller (right) at the brightly modern Innovation Hub located at 707 State St.
November 2017: with Katz again in town presenting at the annual Global Summit on his latest book, The New Localism (which features Erie), the founding partners unveiled the 10,000 square-foot headquarters of the Erie ID on State Street, and Sanchack broke the news of a partnership with Dell. The partner count added UPMC, Ben Franklin Technology Partners, Dell EMC, and MCPc. March 2: Mercyhurst collaborated with Case Western Reserve University and Cleveland State University to form the North Coast Cyber Research and Training Alliance to develop cybersecurity education and regional research and training programs supporting Erie ID efforts. March 20: Erie ID inked an agreement with Singularity University, a Silicon Valley-based technology think tank, to conduct a 10-week accelerator program to help entrepreneurs transform fledgling ideas into startup businesses. "I am looking not just within the Erie ecosystem, but also broadly," Sanchack says on the heels of the Singularity announcement. "What makes them very interesting is they're an innovation thought leader. They focus on things like artificial intelligence, blockchain — things that are industry-changing." The latest announcement is thanks in part to Sanchack's past work with the tech think tank. "That team ran the Smart City Accelerator in Columbus last year in 2017," says the Philadelphia native, who's no stranger to Erie, having spent the first two years of his baccalaureate days at Penn State Behrend and has worked with Singularity as well. 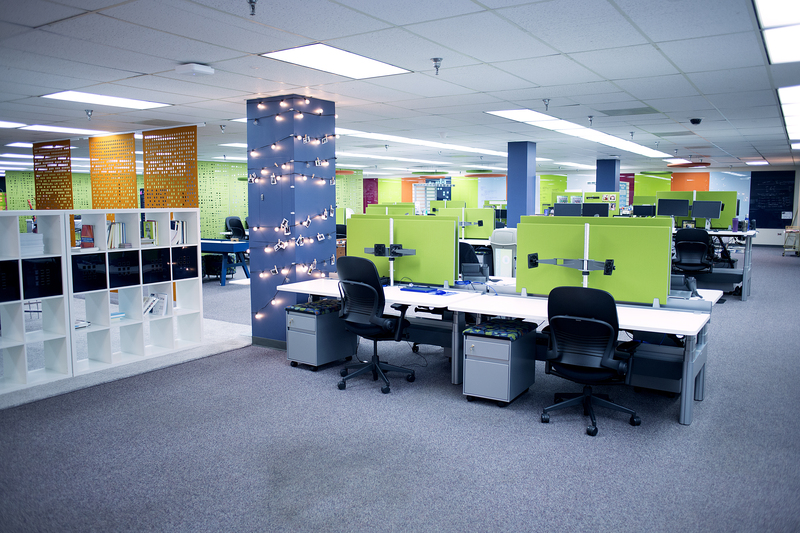 The space, designed by Erie Insurance, appears as one might imagine a fertile ground for new ideas would: Vibrant colors, open concept, rolling tables, walls that — despite what our parents told distinctly not to do — can be written on. The brightly modern Innovation Hub located at 707 State St.
"Sharing our innovation space with Karl and the Innovation District team has already been a great experience," says Christina Marsh, Chief Community and Economic Development Officer at Erie Insurance. "We're seeing multiple opportunities to learn from one another and accelerate initiatives like the one recently announced with Singularity University. Our continued efforts to work collaboratively are truly beginning to pay off." As the walls waiting to be written on become the rough drafts of future businesses to be edited, rewritten, revised, and published is yet to be seen. But ripe with potential for a narrative re-shaping of Erie, the space is ready and the foundation is continually being reinforced with more announcements that Sanchack hints are still to come. "We've seen around the country right now that as cities continue to evolve, oftentimes they become known for something, and that's especially true when you go to smaller-sized cities because they have to be a destination for something," says David Dausey, outgoing Provost and Vice President of Academic Affairs at Mercyhurst and chair of the Innovation District, who was recently announced as the next Provost at Duquesne University in Pittsburgh. "An innovation district, if done correctly, can add a vibrancy and a life and a feeling to the city and downtown that can help it to appear to people both within the city and outside the city that there's something going on and that there's excitement behind what's happening in that city, and that is one of the things that the Innovation District can drive." While naysayers might not see the possibilities through the crossroads, others recognize the abounding potential in the miles ahead for Erie. Katz along with co-author Jeremy Nowak write in The New Localism: "We don't need to travel farther than Erie, Pennsylvania, to see that grand things are possible and that cities can leverage their distinctive advantages." At a crossroads, innovation leads the way for a post-industrial city and region on a path to redefining itself in the 21st century. And in 2018, innovation looks good on an incredibly bright Gem City.